Multiple layers of closure practice. The Basic Tissue sheet is for use in the practice of basic closure methods. The Tissue plate is made of 4 layers developed to match the feel of epidermis, dermis, fat, and muscle. 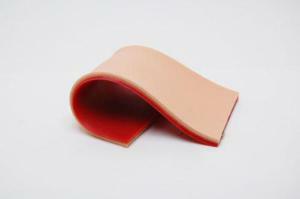 The Advanced Tissue Insert is for use in the practice of all common closure methods. 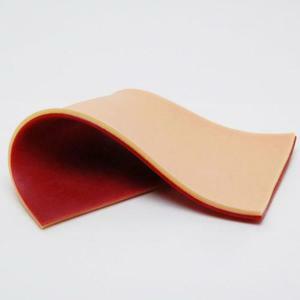 The tissue plate is made of 5 layers developed to match the feel of epidermis, dermis, fat, muscle and includes an enhanced subcuticular layer. The subcuticular layer can be punctured from the side and will hold a suture to simulate pulling together of tissue. The fat layer realistically dissects and will not hold a stitch. All layers accept adhesive and bandage closure methods. The product is completely animal friendly and mess free. During use, the skin layer does not propagate a tear and will appropriately hold a suture. Tissue plates can be saved for evaluation or reused multiple times.